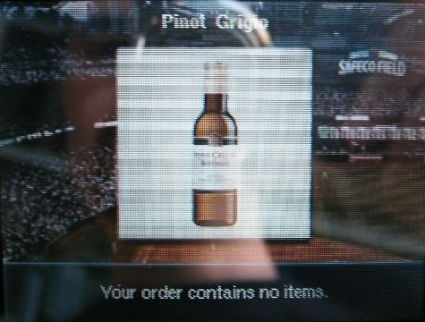 Nintendo's Fan Network allows Safeco Field attendees to enhance Mariners games with software downloaded onto the DS. For a $5 fee, baseball fans can order food, watch live video, play networked games, learn about the players, and even keep up with other baseball games, right from their seats. The Fan Network finally delivers on some of the promise of one of the least-used features of the DS: download play. It is possible with download play to create context-sensitive DS games and services that can be given away freely (or sold) to any DS owner within range, and to add Internet-based bonus content to events. I hope that, based on this example, more downloadable DS services become available and expand the functionality and enjoyment both of the DS and the events to which people bring their systems. There are two Fan Network kiosks, each with a demo DS Lite unit and a (presumably) friendly attendant. These kiosks were selling the Mariners special edition DS Lite unit for $195. I was tempted to buy one of these until I remembered that I don't have $195, I already have a DS, I'm not that much of a baseball fan, and I don't care for the appearance of the Mariners one. I began downloading the software as soon as I approached the kiosk, going through the name entry and registration steps while waiting in line. It is possible to purchase the service at this kiosk using cash or a credit card. If you use cash, you're given an entry code; if you use a credit card, you enter the information directly into the Fan Network program on your DS. This is the preferable option, because you need to enter credit card information to order food, and thus getting it done at the outset eliminates an extra step. DS systems at the kiosk at section 186 have great difficulty maintaining a connection to the download points, which are actually above the kiosk, blocked by a canopy. Because of this, I had to go through registration three or four times before I actually got a good enough connection to send my data through. After waiting 20+ minutes for the kid in front of me to think of a password, and another ten minutes of my own trying and failing to get through, the game had long since started when my wife and I finally got to sit down in our seats. It may have been possible to do all of this from your seat using a credit card, without dealing with the kiosk at all. As long as you're in range to download the software, it seems that you can set up the Fan Network. I would strongly recommend trying this before dealing with the kiosk. It goes without saying that the experience improved somewhat when I got to my seat-- doing something being preferable to not doing something. The midday sun made it extraordinarily difficult to see my screen, which is a major problem for something designed for baseball games. A DS Lite would ameliorate this problem slightly, but not enough for comfortable viewing. It was no problem to put the DS down for a bit while the sun set; I simply occupied myself with the baseball game happening. The food service menu allows you to browse a selection of snacks, meals, and beverages (alcoholic and non-alcoholic), complete an order via a shopping cart system, and have the food delivered to you. The base prices are standard for the park: they start at over $4 for water, but every order also carries a $10 minimum and a 17% service charge. It wouldn't be fair for this review to say that the service doesn't work; browsing food for delivery is convenient and well-implemented, with Nintendo going so far as to include a picture of every item on the top screen. However, the full Safeco Field menu isn't represented on the DS, meaning that you cannot get the garlic fries (DS Fanboy mini review of Safeco Field's garlic fries: 10/10.) Coupled with the service fee, ordering food from the DS just isn't worth it when the vendors are so close to basically any seat. Using the Fan Network's Video option, you can watch a Fox Sports Network feed of the game on the top screen of the DS. I immediately felt like I had entered the future when I tried this; however, it became clear that this was not the useful feature it seemed to be. Instead of providing an 'instant replay' option, the video is a live feed about five seconds behind the actual game. It's also tiny-- I could see the action better from my seat, which was basically outside the Earth's atmosphere. Unfortunately, the video is also overcompressed and blurry-- it is impossible to read any of the text that appears on screen, all of which renders as jagged blocks. This was the option that I thought would be the most useful going in. The technical issues involved with streaming video to the DS, however, made it the least useful of all the Nintendo Fan Network features. You can see the Fan Network's video feed in action courtesy of reader Trevor Verhelst. Checking player statistics is perfectly implemented, and quite useful for new baseball fans or non-fans who have yet to dive headfirst into the statistical obsession that is modern sports fandom. A device designed simply to perform this function would probably help ease anyone into baseball. I came to a troubling revelation later: it's basically a Pokédex for humans. Chilling. Like the stats, it is simple to check games in progress. You select from a list of games, and you get scores and minimal stats about the game. The interface and the display both work well in a no-frills way. The Fan Network offers three games within its software: baseball trivia, word search, and a Memory game that uses MLB logos. Each of these games is networked within the field, allowing you to check your score against everyone else who has played the game that night. Ironically, the point values for each correct answer or solved puzzle decrease over time, meaning that players are penalized for momentarily looking away from the game for any reason-- including the baseball game they came to see. You have to make a decision between playing the DS games and watching baseball. 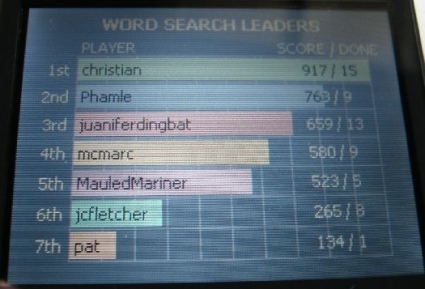 I must also mention that if you really want to play games on your DS, there are better games out there than word search. The DS, when not being used to enhance baseball games, is primarily a video game console. With those caveats, competing in these small games, especially word search, is enjoyable for people uninterested in the actual baseball. The annoyances that plague the service, such as the extra fees, the useless video, and the imperative to ignore the baseball in favor of competitive DS gaming, may hamper enjoyment of this particular service to the point of not being worth your $5, but they don't dampen the promise of downloadable, networked applications for DS owners. We are not condemning the Fan Network at all-- it is a bold experiment in useful, entertaining location-based content-- but this first try is more interesting as a harbinger of future offerings than as a standalone product.